Down at the dry docks here, where workers are dwarfed by propellers larger than houses, the world's largest shipyard is now so efficient that a new $80 million vessel slips into the water every four working days. Not content with making some of the most complex products on the world market, naval engineers for the Hyundai Heavy Industries Company are drawing up computer models to increase the size of the largest container ships by more than 25 percent, creating a supervessel that could carry 10,000 steel containers, enough freight capacity for 30 million pairs of sneakers. Only in 2004, when South Korea exported ships with a value of $15.09 billion, did it definitively wrest from Japan the status of the world's leading shipbuilding nation. But the South Koreans are already looking over their shoulder at China, which has embarked on a path toward becoming the largest shipbuilder by 2015. Chinese competition, which has unnerved American manufacturers, is also putting much of Asia on edge as China rapidly narrows the technological gap with higher-wage Asian neighbors. Container ships and tankers being built at the huge shipyard of Hyundai Heavy Industries in Ulsan, South Korea. There are nine dry docks. "When you are being chased, you have to do something that the chaser cannot do," Han Dae Yoon, chief marketing officer of Hyundai's shipbuilding unit, said of China's ambitions. Company executives use the word "selective" so much that they sound like snobs. Simple ore carriers and oil tankers are out. Technologically complex liquefied natural gas carriers, mammoth container ships and advanced offshore oil platforms are in. "We obviously want the more value-added-type vessel - L.N.G. carriers, more complicated container vessels, ice-class gas carriers," Mr. Han said in his office overlooking some of Hyundai's nine dry docks, a space that only 30 years ago was empty shoreline. "Shipbuilders have to be selective." South Koreans know that 650 miles from here, a similarly barren shoreline south of Shanghai is undergoing a $4 billion transformation aimed at making China State Shipbuilding the world's largest ship maker. "The South Koreans are always working to keep three, four, five steps ahead of the Chinese and Japanese," said Peter E. Bartholomew, managing director with Industrial Research and Consulting. Speaking by telephone from Seoul, the capital, where he has watched the nation's shipbuilding industry for 30 years, he added, "Now the South Koreans are moving more toward the Lexus end in order to have an edge over the Chinese." In a testament of sorts to China's growing economic power, the Chinese are behind many of the successes and failures in 2004 of Hyundai Heavy Industries, the world's largest shipbuilding company. The explosion in China trade has created a worldwide shortage of commercial vessels. Drewry Shipping Consultants of London says that container shipping capacity expanded 10 percent in 2004 and predicts that it will grow 12 percent in 2005 and 14 percent in 2006. With empty hulls in short supply, some rates for carrying goods doubled last year. In response, companies are scrambling to order vessels. After receiving record orders in 2004 - for 102 ships worth $8.3 billion - Hyundai can afford to be picky. With more than three years of work already booked, it is letting Chinese yards win contracts for low-end jobs like simple tankers and bulk carriers. Hyundai has three joint ventures in China, and it already farms out some of its low-technology shipbuilding work to these companies. South Korea's two other major shipbuilders, Daewoo Shipbuilding and Marine Engineering and Samsung Heavy Industries, are juggling a similar wealth of orders. Foreign investors own 24 percent of Hyundai Heavy Industries and 36 percent of Daewoo Shipbuilding. 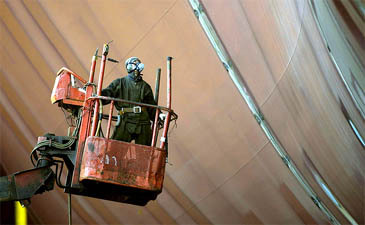 Hyundai, limited by its shoreline, has gained construction space by updating a technique popular in the days of the Vikings - building ships on skids. Using this method, it built a 105,000-ton crude oil tanker this fall. At the conclusion of construction, hydraulic jacks pushed the tanker down greased skids to a waiting barge, which towed it to deep water. Hyundai plans to build 15 more tankers this way. But China's booming economy has also resulted in short supplies of some building materials, including steel. For shipbuilders, that means that the price of steel plate jumped 70 percent in 2004, contributing to a $30 million loss at Hyundai Heavy Industries in the third quarter. With steel accounting for as much as 20 percent of the material for a ship, Hyundai found its profits squeezed as it sold vessels built in 2004 for the lower prices contracted in 2002. With no significant letup in sight for Chinese steel demand, the shortage of steel captured special attention in recent weeks when the automaker Nissan announced that it would have to reduce production for lack of material. The steel shortage threatens to crimp car building at Honda and Toyota, as well. Struggling to meet demand, Japan is producing steel at levels not seen since 1973. In 2005, South Korea's three largest steel makers plan to increase their investments in factories and machinery by 52 percent, or about $3.7 billion, according to the Korea Iron and Steel Association. Hyundai responded to the rise in steel prices by increasing the average price of its ships in 2004 by 23 percent and trying to win more contracts for technologically complex vessels like the dome-shaped carriers that run on liquefied natural gas. L.N.G. carriers cost on average $180 million, up to twice as expensive as other vessels of the same weight that are powered by diesel fuel. As China and other countries move to this comparatively clean-burning energy source, the consumption of liquefied gas is forecast to increase 25 percent a year for the next decade. During this time, the world's L.N.G. fleet is expected to double, to around 250 ships. Moving aggressively, Hyundai, Daewoo and Samsung won almost 90 percent of the contracts for L.N.G. tankers awarded worldwide in 2004. 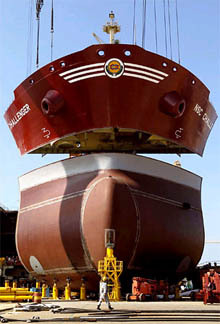 In the biggest single contract, Hyundai won orders and options from BP Shipbuilding to build eight such tankers. But even here, South Koreans feel the technological gap narrowing with China. From a marginal competitor in the 1990's, China has become the world's third-largest shipbuilding nation, winning 14 percent of orders in 2004, as measured by tonnage. Japan was second, with 24 percent, and South Korea led, with 40 percent, according to the Shipping Intelligence Network of London. The United States, whose share of the world's commercial shipbuilding market has steadily declined over the last two decades, now has less than 1 percent of orders. China, like Japan, is taking steps to channel much of its trade into Chinese-made ships. Most of Japan's vessels are built for Japanese exporters. The Chinese are seeking, as well, to improve their shipbuilding skills as a step toward creating the kind of navy that will allow them to patrol commercial sea lanes. By contrast, South Korea largely produces for the world market. In the Chinese shipyards, labor productivity lags far behind that in South Korean and Japanese yards, which are about even. But this winter, workers outside Shanghai are dealing with something new: China's first domestically made liquefied natural gas tanker. In a contract signed in August, Hudong-Zhongua Shipbuilding is to build five L.N.G. tankers. The shipyard, which is state-owned, wants to become the main supplier of liquefied gas tankers to feed the nine L.N.G. terminals that China plans for 2010. Mr. Bartholomew, the shipping consultant, said of South Korea, "The Chinese are always trying to nip at their heels, but they are not there yet."